I had so much fun using the brush tipped markers on this bird. 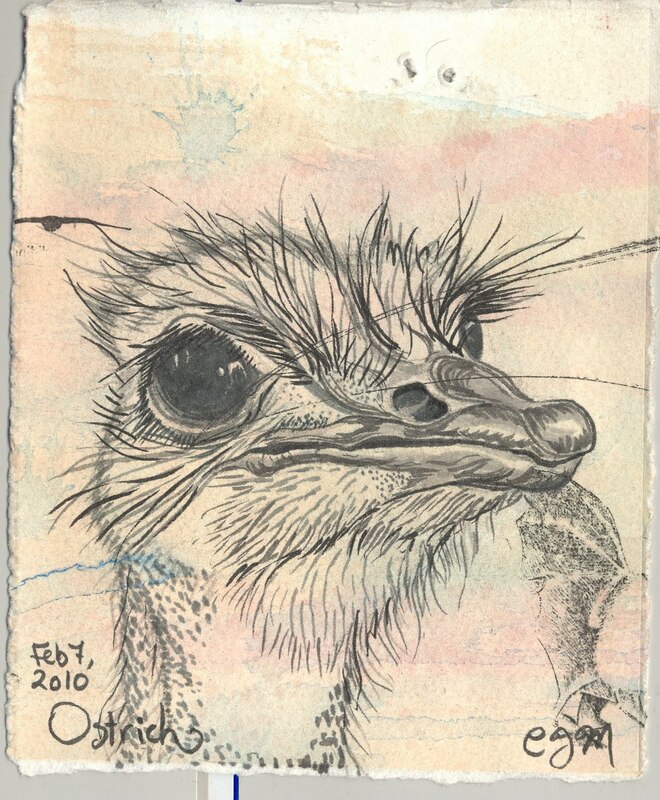 Ostriches have the most bizarre faces. With those huge eyes and tiny hair-like feathers sticking out everywhere, they manage to be moth awkward yet beautiful at the same time. I visited my grandparents in Kansas two years ago, and one day I just needed to stretch my legs, so I took a walk down to the main street. I found a junk shop, and in addition to some vintage 80s era knock-off Strawberry Shortcake dolls (wish I had gotten those, too!) I found two ostrich eggs. I thought it was so random and funny that I bought one. And the whole plane ride home, I was nervous that it would get crushed, even though I had it in my carry-on. I shouldn’t have worried. Apparently, ostrich eggs are fairly hardy, for eggs. I have it on display in my curiosity cabinet, next to some porcupine quills and a fairy I sculpted out of clay in 1998. Update 4/13/13 This bird is sold. Thanks, Jeff & Julie.